It was announced yesterday that Dreamworks – the company behind Shrek and the recent comedy blockbuster I Love You, Man – acquired the life rights from the King Estate to make a new biopic on the life of Dr. Martin Luther King Jr. But what part of Dr. King’s legacy is Spielberg proud of? 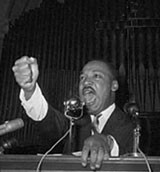 Will the movie give a taste of Dr. King’s famous speech at Riverside Church in New York City where he called the U.S. government “the greatest purveyor of violence in the world today?” Seems unlikely. While Hollywood somehow managed to produce a great film on Gandhi in 1982, it’s hard to imagine that they will get this one right. The radical side of King – the one that fought not only for civil rights, but also against the Vietnam War and for economic justice – has been consistently downplayed or ignored by the mainstream media since his death, because that King continues to threaten the status quo today. Since this new film will likely reach an enormous audience and considerably shape how the average American sees Dr. King, the peace community should seek a dialogue with Dreamworks and the producers about the script as this project moves forward. I heard somewhere that his children were rethinking and/or not happy about the way this movie was going. Have you heard the same? Yeah, there does seem to be a divide. Dexter has control of the estate, and MLK III and his sister have, at least in the past, felt that Dexter is not handling things well. I haven’t really read anything about their thoughts on this movie deal in particular though. Sorry I didn’t get in touch with you sooner, but I misplaced your card. I hope all is going well with you and your SJC course on nonviolence. How can one hope to influence the content of this film so it represents a complete picture of King’s belief’s? Is there a way to write to Spielberg?